Back in school, we all learned about photosynthesis, the process by which a plant converts light energy into chemical energy that it uses to live and grow. When we learned about photosynthesis in school, most of us learned that the process requires sunlight. However, due to technological advances over the last several decades, humans have learned to trigger photosynthesis using artificial lights, now commonly known as grow lights. In this article we will discuss photosynthesis in great detail to understand how you, as a grower or farmer, can better harness the power of artificial light to grow your plants. We will begin by providing a recap of the photosynthetic process. In order for a plant to undergo photosynthesis, it needs three key “ingredients” – water, carbon dioxide, and light. To get the first ingredient, water, the plant’s roots draw in water and minerals from the ground, typically soil. Some plants, such as cacti and lily pads, use other ways to take on water, but roots are the most common. The plant acquires the second ingredient, carbon dioxide, through its leaves, which take in carbon dioxide from the air and eventually release oxygen, a product of photosynthesis. Specialized cells in the leaves of the plant, called chloroplasts, absorb light using a pigment called chlorophyll. In naturally occurring photosynthesis, this light comes from the sun. However, as we will discuss, growers and farmers can simulate the process using artificial light from grow lights. 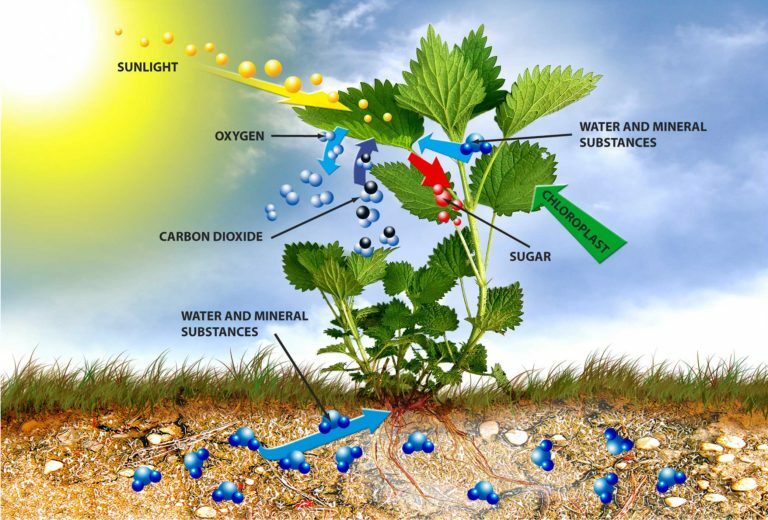 Once the plant has taken in these three key ingredients – water, carbon dioxide, and light – photosynthesis can occur. Energy from the light creates a chemical reaction between the water (H2O) molecules and the carbon dioxide (CO2) molecules, breaking them down and reorganizing them into oxygen (O2) and a form of sugar called glucose (C6H12O6). The oxygen is released back into the atmosphere, and the glucose is retained by the plant as a form of chemical energy. As you can see, the photosynthetic process is a transfer of energy from the light source (typically the sun) to the plant. The plant might use this energy to grow taller, to fruit, or to flower; or, the plant might store the energy to use later. If an animal eats the plant, the energy is then transferred to the animal, and such is the circle of life. So, how do grow lights fit in to photosynthesis? As we discussed, light is one of the key ingredients of photosynthesis. While photosynthesis typically involves sunlight, it can be simulated in indoor gardens or greenhouse environments using artificial lights. In order to understand how to best use artificial lights to grow plants, it is best to review a few more key terms related to photosynthesis. The first term we will discuss is light intensity. When a plant absorbs light energy for photosynthesis, it absorbs it in the form of photons, which are electromagnetic bundles of energy. Chloroplasts in the cells of the plant’s leaves contain a specialized greenish pigment called chlorophyll, which aids in the absorption of photons. The number of photons that a plant absorbs via its chloroplasts directly influences the rate of photosynthesis in the plant. As light intensity, also known as Photosynthetic Photon Flux Density (PPFD) in the world of horticulture, increases, so does the rate of photosynthesis, up until a certain point called the saturation point. Different plant species have different saturation points, where the rate of photosynthesis flat lines. The saturation point for plants that thrive in shady environments is a much lower intensity compared to the saturation point for plants that prefer direct sunlight. The saturation point is essentially the upper bookend for light intensity – light intensity higher than the saturation point does not increase the rate of photosynthesis. The lower bookend of light intensity is called the light compensation point. This point marks the minimum light intensity a plant requires to maintain itself and stay alive. If a plant receives light that is lower than the light compensation point, it may no longer be able to undergo photosynthesis and will eventually die. Plants that prefer shade have lower light compensation points than those that prefer direct sunlight – that is, they can still survive with lower intensity light whereas other plants might not. As you can imagine, providing the correct intensity of light for your plants is critical in ensuring they grow and thrive. Not providing enough light intensity could cause your plants to die, while providing too much intensity is a waste of energy and could cause your plants to overheat or could damage the plant’s chlorophyll. You can use horticulture lighting systems to increase light intensity in two ways. First, if you have a greenhouse that relies primarily on natural light, you can use artificial lights to add intensity during periods of limited natural light (e.g. long winters, unusual weather patterns, cloudy days). Secondly, if you grow your plants in an indoor environment with no access to natural light, you can use horticulture lights as the sole source of light for photosynthesis. Regardless of which way you are using the horticulture lights, it is important to understand the level of light intensity needed by your plants, and to adjust your lighting conditions accordingly. Now that we have covered light intensity, we will turn our attention to light quality. As you may remember from physics class, light comes in a range of wavelengths. In the 1970s, two researchers, Dr. McCree and Dr. Inada, conducted experiments to determine which wavelengths of light a plant uses in photosynthesis. They created a photosynthetic response curve, dubbed the McCree curve (shown below), to explain that plants can use light in the 400 to 700 nanometer range for photosynthesis. This range of wavelengths is known as Photosynthetically Active Radiation (PAR). 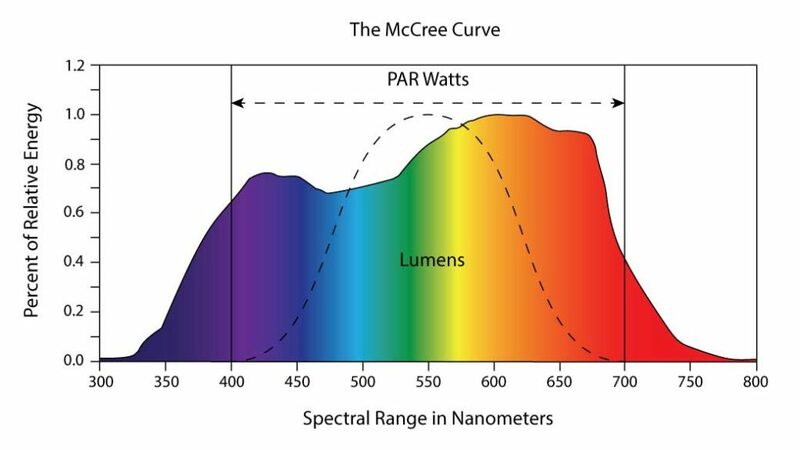 The McCree curve also explains which wavelengths within the PAR range are most effective for photosynthesis, with red and blue light taking the cake. The PAR range is slightly smaller than the range of light that humans can see, called the visible spectrum, which ranges from 300 to 800 nanometers. When considering a horticulture lighting system, it is important to understand where the light system falls on the PAR spectrum. Certain types of lights used in horticulture lighting systems, such as LED lights, do not provide the full PAR spectrum of light to plants, meaning they are less effective at promoting photosynthesis. Consider trying Double Ended HPS lights, which do provide the full spectrum of light wavelengths used in photosynthesis. It is also important to consider that all light bulbs degrade over time, and as a result their color spectrum shifts over time. For this reason, amongst others, it is important to choose high quality bulbs such as the Philips bulb that is included in DimLux HID and CMH systems. The last term we will discuss is photoperiod, also called light duration, which is the amount of time that a plant is exposed to light within 24 hours. If you turn your grow lights on for 14 hours a day, for example, the photoperiod is 18 hours. The amount of time your plant is in the dark within 24 hours is called the skotoperiod. In our example, the skotoperiod would be 6 hours (24 hours minus the 18 hour photoperiod). Both periods are immensely important for a plant’s health and growth. The duration of the photoperiod influences the overall light intensity that a plant receives over 24 hours. As we previously learned, light intensity impacts the rate at which a plant undergoes photosynthesis, so photoperiod length also impacts the photosynthetic process. In many species of plants, the lengths of photoperiods and skotoperiods can influence reproductive growth in addition to photosynthesis. Short day plants typically flower during long skotoperiods, while long day plants normally flower during short skotoperiods. Since photoperiod and skotoperiod lengths impact both photosynthesis and reproduction, growers can manipulate these periods to promote or suppress flowering. While light intensity, light quality, and photoperiod are the key factors in photosynthesis, there are many other factors that influence the process. For growers who use greenhouses or other indoor spaces to grow their plants, temperature and the availability of CO2 have huge influences on photosynthesis. Let’s take temperature, for example. If temperatures in the greenhouse become too high, pores on the plant’s leaves called stomata that allow for CO2 intake, may close to prevent the plant from losing moisture. Without the ability to take in CO2 or release oxygen, the plant will be unable to undergo photosynthesis at all. Low temperatures may also stall photosynthesis, since the chemical reactions of photosynthesis cannot occur if temperatures are too low. The number of lights, the distance from lights to plants, and the intensity of lights all impact greenhouse temperature, so it is important to monitor these conditions closely. CO2 availability also plays a role in how well plants can undergo photosynthesis. When plants are undergoing healthy levels of photosynthesis, they consume CO2 at rapid rates. If you have a densely packed greenhouse or indoor garden with little ventilation, you can ensure a healthy supply of CO2 by pumping the gas into your greenhouse. Many growers add CO2 to their growing environments at levels up to 1,200 ppm, as this increases photosynthesis rates in most plant species. Research has found that CO2 levels over 1,200 ppm do not increase photosynthesis, so it is not necessary to increase CO2 levels above this amount. Another way to enrich CO2 is to ensure your greenhouse is properly ventilated so plants can receive an adequate amount of CO2 through fresh airflow. A plant’s access to water can also have a large impact on photosynthesis. If a plant is not taking in enough water through its roots (or through another means) it will become dehydrated. The plant’s stomata will then close in order to help the plant conserve water. As we mentioned earlier, if a plant’s stomata are closed, it cannot take in CO2, which is one of the key ingredients for photosynthesis. On the other hand, if the plant is exposed to too much water, its roots may become rotten. Lastly, Vapor Pressure Deficit (VPD), can have a significant impact on photosynthesis and your plant’s overall health. VPD measures the difference between the amount of moisture in the air, and the amount of moisture the air can hold when it is fully saturated. High VPD indicates dry air, while low VPD indicates moist air. If VPD becomes too low (i.e. the air is too moist), a film of water could form over your plant’s leaves, making it difficult for them to exchange gas and rendering them more vulnerable to rot. On the other hand, if VPD is too high (i.e. the air is too dry), your plants could become dehydrated and display false nutrient deficiencies. Fortunately, indoor growers can adjust VPD in their greenhouses by adjusting light intensity. Growers can refer to a technical VPD calculation and chart that uses greenhouse air temperature and relative humidity to calculate the VPD in their greenhouse environment and adjust accordingly. Or growers can use the DimLux Maxi Controller, which is the only environmental and light control system that calculates VPD automatically, making it much easier to monitor and make adjustments quickly. As you have read, photosynthesis is a delicate process that is influenced by a wide variety of factors. Understanding the effects of different lighting systems on photosynthesis can be daunting, but now that you understand the ins and outs of photosynthesis, you are better equipped to choose the horticulture lighting system that is right for you and your plants. Not all horticulture lighting systems are created equal; the importance of doing good research cannot be stressed enough. When investing in a horticulture lighting system, it is also important to consider not just how the system will impact the plants’ exposure to light, but also how it will impact other environmental factors such as temperature, access to CO2 , Vapor Pressure Deficit, and humidity. There are certain horticulture lighting systems, such as those made by DimLux, that can control external factors such as CO2 and temperature, making it easier to regulate photosynthesis.